The transition from Thanksgiving to Christmas is a much-debated topic in the U.S. today. In this article, Jill Burroughs discusses the lead up to Christmas with various MBU students. Her feature story is paired with Matt Williams’ opinion piece discussing when Christmas music is appropriate on the radio. Twas the month before Christmas and all through the store, decorations hung with a turkey and pumpkin next door. The garland was hung on the windows with care, in hopes that St. Nicholas soon would be there. 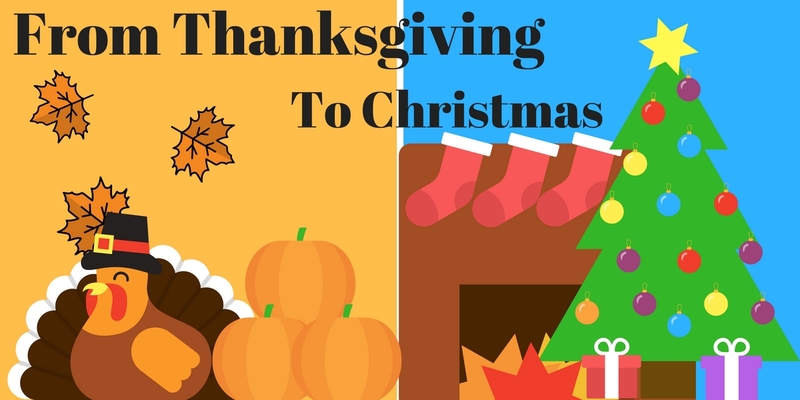 The Christmas season is full of joy and merriment, but before is a holiday that is commonly overlooked by the jolly spirit, Thanksgiving. Some people embrace the excitement of the approaching Christmas as early as the beginning of November. On the other hand, some prefer to give Thanksgiving its time before celebrating the red and green. Christmas is certainly the year’s most important holiday in America, but Andrew Grant, a senior sports management major from Dunblane, Scotland, has a slightly different view on the Christmas experience. There are many elements that go into the Christmas season such as mistletoes, jingle bells and Christmas trees, but not everyone focuses on those material things. For Clayce Fletcher, junior human resources major of Benton, Illinois, when the weather changes, so does his holiday spirit. “I think the Christmas season starts before Thanksgiving. I think when it gets cold enough where I have to get a jacket I start thinking about Christmas stuff,” he said. With a warmer November, having Christmas spirit was a difficult task for Hannah Wood, MBU graduate who is now assistant director of Student Activities. “I’m not quite ready for that and I think this year it’s harder for me to start earlier because it’s like 60, 70, 80 degrees out right now,” Wood said last month. But temperatures have finally begun to fall and, ultimately, the debate of Christmas before or after Thanksgiving depends on an individual’s preference. OPINION: Deck The Halls, But Not Yet? I am a Christmas nut roasting over an open fire. Maybe it is a problem. Maybe it is a gift. I simply can not hold off my enthusiasm for the Christmas season. With Mannheim Steamroller, Relient K, Michael Buble’, Kenny G, Alabama, Andy Williams, Mariah Carey and my recent favorite Brett Eldredge, my holiday season kicks off somewhere between the Fourth of July and Halloween. OK, more reasonably the Fourth of July. I am often slated as uncaring toward other holidays. The kill-joy of late-night Halloween trick-or-treaters. But for me, as a Christian, Christmas is the pinnacle of holidays. It represents the moment in time when God himself, incarnated as a baby, through a virgin birth, entered this world. It was when wise men set out for an extended journey, to meet this kid and give him the most precious of treasures. It marks the most charitable time of year, when people are more giving, kind, sweet and loving. In a way, Christmas is simply when the world acts the most like Christ. It is when we all go to church. It is when “miracles” come true. It is when all of us in some way or another believe in something bigger than ourselves. For these reasons, I long for Christmas. For me, Christmas is a small glimpse of Heaven, a cracked window of opportunity for the world to come together for a singular cause. Whether it be about Santa Claus or Jesus, I love hearing tunes that are joyful and happy. Now please, do not paint me as simply someone who wants everyone to be jolly-go-lucky all of the time by throwing care and caution into the wind. With all of this said, the question that should be asked is not when should Christmas music start playing, but rather, when should it end.